Member of the Selangor Legislative Assembly Jenice Lee was one of the DAP leaders who had delivered speech at Merlimau DAP dinner on February 25. 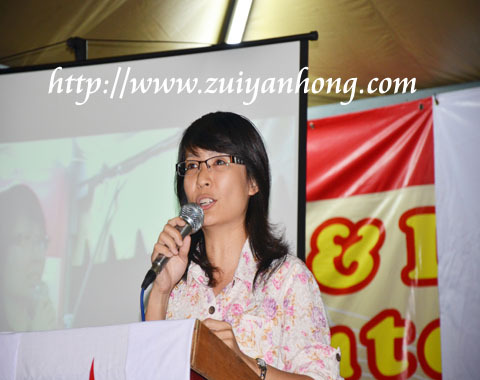 Most of the DAP legislators are male, so the presence of Jenice Lee in Merlimau was a surprise. Enjoyed listening to Jenice Lee mentioned about the interesting story of Selangor Pakatan Rakyat government. According to Jenice Lee, Selangor Pakatan Rakyat government provides one-stop welfare. Selangor people start collecting money when they just born. Selangor Pakatan Rakyat government will pay you money when you have a date with the king of hell. Wow, so nice and so good! Well, I have to migrate to Selangor. Would Jenice Lee do me a favour?